Less Is More (Difficult) | Come Due Maiali / "Like Two Pigs"
At $24, spaghetti with tomato & basil at NYC-based Scarpetta is priced within a couple of dollars of the other, impressive-sounding, meat-centric entrees, such as short rib and bone marrow agnolotti, duck & foie gras ravioli with a marsala reduction, etc. 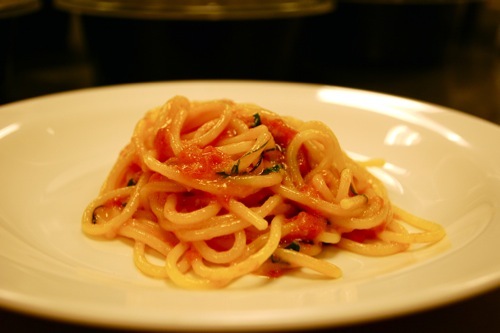 It seems to be a deliberate (and laudable, in my opinion) choice by the chef who is trying to make the point that a simple dish of spaghetti with tomato and basil can be on par with (if not superior to) the other menu items in terms of complexity and enjoyment. I have always believed simple dishes were infinitely harder to execute well, such as a perfectly cooked piece of fish or an omelet. “Simple to the point of austerity”, – one of my (and Jeff’s) favorite quotes and inside jokes from Sarah Caudwell, a late barrister and murder mystery writer with a sense of humor as sharp as her intellect. The spaghetti was pretty amazing; especially washed down with a glass of a “simple” 2004 Cosimo Taurino Salento Rosso Notarpanaro from Puglia. Still, how hard can this really be? Hint: it is all about attention to detail (plus a secret ingredient – butter!). Chef Scott Conant, in his interview with Today.com’s journalist Katie Quinn, says, “Anything simple is difficult, to be honest with you…It’s a culmination of just small things that are really done properly “. This entry was posted in food & wine and tagged cooking, food, nyc restaurants, wine by Come Due Maiali. Bookmark the permalink.